There are two “magic” triangles that I find very useful when describing creative work. One has been around for a long time, while the other I invented. NOTE: I may not have invented this second triangle, but I haven’t seen it described this way before. The problem is that we can only pick two. How can I get this project done by the deadline, with the quality the client expects and within the budget I am given? Notice that I didn’t ask: “With the quality I expect.” But, rather: “With the quality the client expects.” Exceeding the expectations of the client is a great way to get more work. Working to exceed our expectations is a great way to miss the deadline and blow the budget. For me personally, everything I do is deadline-driven. So I am continually asking myself: “What do I need in order to get this done on time?” If I were to do a project where quality is more important, I’d make sure that I didn’t assign myself a deadline. Norman Hollyn is responsible for me thinking about this. As we were creating 2ReelGuys.com, we would get into long discussions about whether story-telling or technology was more important to an editor. Norman always came down on the side of story-telling, while I felt technology was more important. NOTE: In teaching students, I’ve come to realize they are obsessed with technology; and not sensitive enough to the stories they tell. So, in my classes now, I make a much bigger point of teaching the importance of thinking about the story you are telling. However, as I became more involved in hiring people for creative teams, I realized that the story vs. tech balance was insufficient. Which lead me to create this illustration. 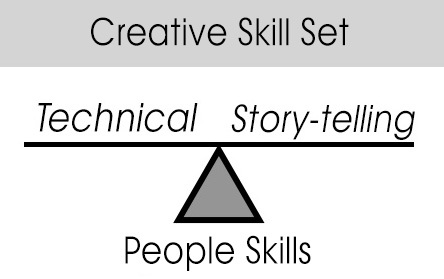 What this image says is that story-telling and technical skills are equally important, but both rest on a foundation of people skills. If no one wants to work with you, all the story and tech skills in the world won’t get you a job. It is easy to become obsessed by our story or the need for better technology. But no creative task lives in a vacuum. Creativity is collaborative and our ability to work with others is essential to completing any creative task. From funding through production to distribution, we are always working with others. We need to make sure we are worth working with. I also have very limited patience with editors who say: “I can’t be bothered by all this technology, I tell stories.” This is simply arrogance. 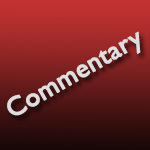 A great story-teller with no technical skills has no ability to express their story. Instead, they must rely on assistants to make sure their gear is working, video formats are converted, final output meets all technical specs…. in other words, that editor is crippled in their ability to complete a project because they don’t have sufficient technical skills. Darned if we don’t somehow find a way. So, this article is a HUGE reminder of the humanity of it all! Doing it perfectly with little time and less money is going to blow up your mind unless you learn to set expectations. Thanks, Larry. You nailed it again!